Nicholas. An ex-colleague and a good friend. We’ve known each other for 8 years and counting. Never got a chance to see who his significant other is, until today. His wedding day. Here are some photos from the evening and a simple video stitching together the brief moments I managed to catch on camera. Singapore Watsons Members’ Only One Day Sale on 27 Dec 2012 at 38 Watsons Outlets Island Wide. Merry Christmas to one & all! May you & your loved ones be filled with joy and blessed with great health to scale greater heights ahead. 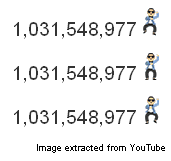 Check out the animated PSY next to the YouTube counter. One billion views!! What an achievement for PSY!! I literally eat faster than I can blog haha! If only there’s a technology that can translate our thoughts into words instantly, that’ll be great! Swee Choon Tim-Sum. This is a great supper place which we discovered by chance. It’s open late in the night and has great dim sum. Yum! It’s crowded as usual with lots of people queuing for seats in the air conditioned area. Since the evening is pretty cooling, we decided to go alfresco and settled quickly in an available table. Swee Choon Tim-Sum has expanded since the last time we came, taking over its neighboring shops and the back alley. Yet there’s still a long queue for seats! The popularity attests for its charm amongst Singaporean foodies. Dim Sum is always more fun with more people because we can order a wider variety. However since there’s only the 2 of us we’ll just go with our familiar dim sum favourites. Firstly, the Egg Tarts. We didn’t really like the egg tarts. It’s a bit bland to me and the crust is not flaky enough for a Portuguese style egg tart. Personally I prefer the ones from Tak Po. Speaking of which, I haven’t gone to Tak Po for quite a while. Ever since their standard dipped when I last dabao from them. Next, Deep Fried Beancurd Prawn Roll. Nice! Crispy. Generous portion of prawns. Dipped in mayonnaise. I’m in heaven. Red Bean Paste Pancake is good too. The red bean paste is tasty and not too sweet. My only complain is that the skin is slightly thicker at the folds. It’ll be good if the folds are not overly overlapped so that I don’t get too much of the skin and more of the red bean paste. I’ve also always ordered Fried Prawn Dumpling when having dim sum. I’m not wow-ed by Swee Choon’s version. Dislike. I won’t order it again here. The skin is overly fried and I didn’t get the prawn taste. Har Kow is good. The skin is not too thick and the portion of prawns is generous as well. Fried Hor Fun with Shrimps in Creamy Egg Sauce is average. It’s not bad, just not outstanding. I prefer the one from Kim’s Fried Hokkien Prawn Mee at Jalan Eunos. Last but not least, Swee Choon Tim-Sum’s signature dish – Swee Choon Mee-Suah Kueh. This is one dim sum you cannot find anywhere else. It’s creative and has an interesting texture & taste. Friends who’ve tried it also rave about it. It’s a must eat when you dine at Swee Choon Tim-Sum. That’s the end of my birthday dinner report. Hope this helps to provide some insight on a potentially great midnight dim sum place. Do note that parking may be a challenge as many car park lots were removed due to construction. It’s a fine line between a joke and a prank? I can’t help wondering what will happen if any of the folks turned violent? Afterall we never know what our natural reflexes will be until we’re faced with the situation. Many may scream and squeeze into the corner, however there may be some who’ll wave and punch frantically? A wedding in Malaysia style. I’ve previously heard my Malaysian friend illustrate how chaotic a Malaysia style wedding can be. It’ll be free seating with ushers shouting across the wedding venue, looking to fill up empty seats. And if we arrived even slightly later, we may not even be able to sit together. Tables can be added liberally, extending beyond the banquet hall into the carpark. We’ll be hot, sweaty & sticky when the time comes. Karaoke is also common during the wedding where the guests will sing their heart away. So, I was mentally prepared for a very interesting experience as I set off to cross the woodlands causeway into Johor Bahru for my very 1st Malaysia wedding. Lo and behold, the 1st shop I see is…RotiBoy! Oh…how I miss RotiBoy. I still remember the long queues, the irresistible aroma, the crusty top & the buttery inside. Yum! So the story is, I approached RotiBoy’s storefront enthusiastically, salivating as the memories flood my mouth 😛 And then there was the queue. Disappointed. No RotiBoy buns being sold yet. Bummer. Between queuing for the glorious RotiBoy bun and the risk of reaching the wedding venue late, I chose the latter 🙁 My RotiBoy bun…Ok, that’s my sad RotiBoy story. The next immediate issue at hand is the taxi to the wedding restaurant. We are fearful as we’ve heard numerous Johor Bahru horror stories. Worse still, we walked around City Square looking for a decent taxi-stand and didn’t see any. We saw a few taxi drivers hanging out at one of the exits and were apprehensive. At long last, we arrived at the wedding venue. Safe & sound. On time. After confirming that we’re at the right place, we approached the reception table. Hmmm…no ang pow box. So we asked whether to give the red packet now or later. The lady said it’s the same and we handed over the red packet which was promptly slotted into her bag. Back to the Malaysia style wedding. It was totally different from what we were expecting. There were no rowdy situations and there’s seating arrangement (which impressed my Malaysian friend). We were all seated within the air-conditioned restaurant. No tables were added. And there’s no karaoke (we can hear the karaoke next door though). Essentially, it’s very much like a Singapore style wedding except that we have to bring our passports along. As with the all-familiar praises for Malaysian food, the wedding banquet is superb at half the price. That is if you look at it from the Singaporean perspective. It could be very expensive for a local. I was especially impressed with the 2nd dish – Double Boiled Dried Seafood with Whole Chicken in Superior Soup. I heard it’s similar to Buddha Jump over the Wall? It was filled to the brim with ingredients like abalone, fish maw, mushroom and chicken and the soup was extremely flavourful. It’s an absolute delight. The Sliced Pork Served with Steam Buns was very well received too. It was served instead of the usual rice and noodles. The pork is very tender. The sauce is not too salty. And the fats didn’t leave us with the disgusted feeling. It was just nice. 1. Red wine was served out of a beer jug instead of the usual wine bottle. 2. Beer is served by a dedicated lady wearing a uniform different from Cathay Restaurant’s staff. All in all, it was a very good wedding banquet. The food is good and the company is great. We’re blessed to have been invited by Terence & Chloe to their wedding in Malaysia. Thank you. Not so long ago, I came to know about this great Japanese restaurant at AXA Tower – Kotobuki. The food is good and the pricing is reasonable. In fact I’m a returning customer. This is my 2nd visit. Being a cold soba fan, I couldn’t resist ordering the Wafu Men Set – 3 Kinds Mixed Cold Noodles with Tempura on my 1st visit. The noodles are really nice, just too much. Half-way into the set I got kinda sick of it as I only have the soba and tempura. So the variety is not there. If I had shared this set with another friend and ordered some side dishes, it may not be that bad. On my 2nd visit, I ordered the Sakura Sushi Set – Mixed Sushi with Mixed Tempura and Hot Soba. My Japanese colleague had it on our 1st visit and said that it was good so I went for it. The sushi is really fresh and the tempura’s batter is light and not too overwhelmingly oily. My only dislikes are the sotong sushi and capsicum tempura. Only reason being I’ve never liked these two items all the while. We even ordered a 2nd serving alas they ran out of avocado. It’s simply not the same with cucumber 🙁 I will definitely order this on my next visit if and only if it’s avocado. Their beef curry and donburis also received positive feedbacks. In fact the beef curry was highly recommended by the friend who introduced us to this Japanese restaurant. All in all it was a great dining experience. The company is good and the food is great. It feels like we are getting so much value for the buck. I’ll definitely return for more if I get the chance to do so. Kotobuki also has private rooms available with a minimum purchase of S$200. Here’s Kotobuki‘s website if you’re interested to find out more. It is no secret that Singaporeans love food. A simple Google search will reveal tonnes of food related websites & blogs. Login to facebook and there will be photos after photos of what we’ve eaten for breakfast, lunch, dinner and supper. Or…what folks have whipped up with their Happy Call Pans which used to be only available online and is now selling at major electronics stores. Guess it’s simply too popular for local retailers to ignore. Turn on the TV and there will be a huge variety of shows featuring various food haunts around Singapore and beyond like Malaysia, Taiwan, Hong Kong & Japan. And the list goes on. I still vividly remember going around taking photos of a buffet spread when a German colleague came up to me and commented that he never understood why Singaporeans love to take photos of food. Why do we need to document what we eat? This is true even when we are abroad. We’ll be uploading photos of what we ate on the trip, with some folks doing it real-time too. He’s never done it and he only sees this practice in Singapore. In a way, this culture is so uniquely Singapore. I never gave it much thought before this and didn’t classify this activity as a Singaporean “phenomenon”. For me, I like to take photos so that I can recall what I had at the respective makan places and in turn share whether the food is good with my family and friends. It’s easier with photos. A picture really speaks a thousand words. The challenge is to do something with the photos after taking them. I’ve always been asked what do I do with the photos I took. Frankly speaking, nothing much. The photos usually just continue to reside in my phone. Haha…It’s so much easier to be trigger happy in the moment versus having to go through and sort out the photos later on. However I decided to take action and grab change by the horns. No point taking all these photos if they’re just taking up space and are not going to benefit anyone right? Starbucks 12 Days of Gifting is back!